"The subject of motherhood and loss appears in one of Ono's early works: A Grapefruit in the World of Park (1961). A study of the surreal script of the piece reveals a dialogue which intertwines snippets of everyday conversation between a mother and her young child, a daughter named Betsy, having a picnic in the park (perhaps Central Park) eating clams, grapefruit and lollypops, with an almost delirious dialogue about the surroundings, and a dead child. The conversation between the mother and child is about normal parental caretaking things: "Why don't you put on your sweater/I'm not hot Mommy can I have something to drink/They're all gone honey/Now put on your jacket it's getting chilly...". At one point of them recites the Pease Porridge Hot nursery rhyme. The symbolism of the grapefruit, which forms the title and subject of the piece, and appears repeatedly throughout it, is ambiguous. The fruit could represent a child, a womb, or motherhood. In a biographical poem published in 1966 listing important events in Ono's life: late adolescence: gave birth to a grapefruit... The script of Grapefruit in the World of Park was accompanied by atonal music, wild laughter and unclear words; a kind of aural expression of female "madness". 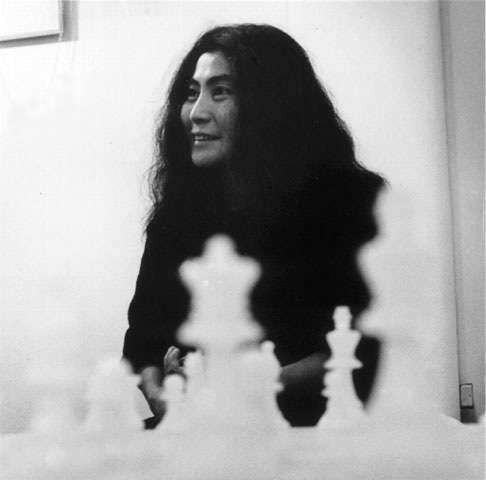 Ono's focus on the voice and the pushing of its limits during the sixties in these pieces set her apart from the use of the musical instrument (usually the piano, cello or violin), by many Fluxus artists. Where her work touches on the musical instrument, it is obliquely, in her pieces involving water, for example, a material used in many Fluxus sound performances. Cage, Brecht, Palk, Shiomi, Tomas Schmit and others all introduced water as a means to create sound, and Ono included the sound of a toilet flushing in her concert Grapefruit in a World of Park (1961).